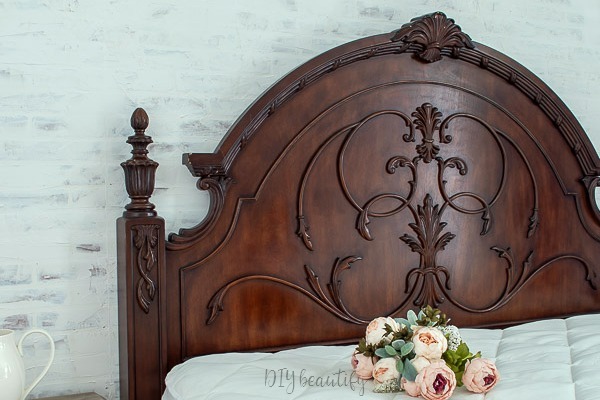 Turn a boring wall into a European-inspired beauty! 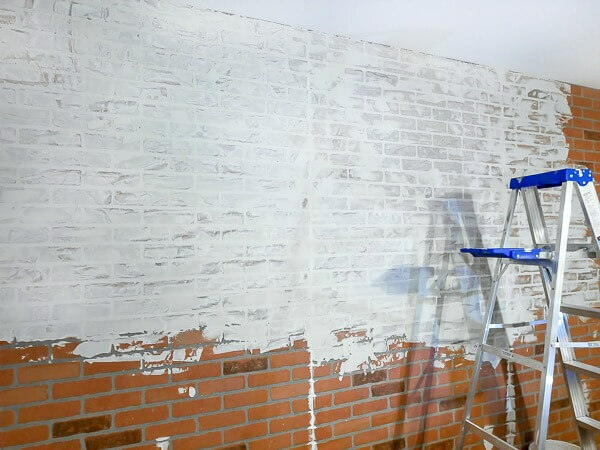 I'm sharing our faux brick wall with German schmear project, an easy one-day wall treatment with gorgeous looking results! Hello, hello! 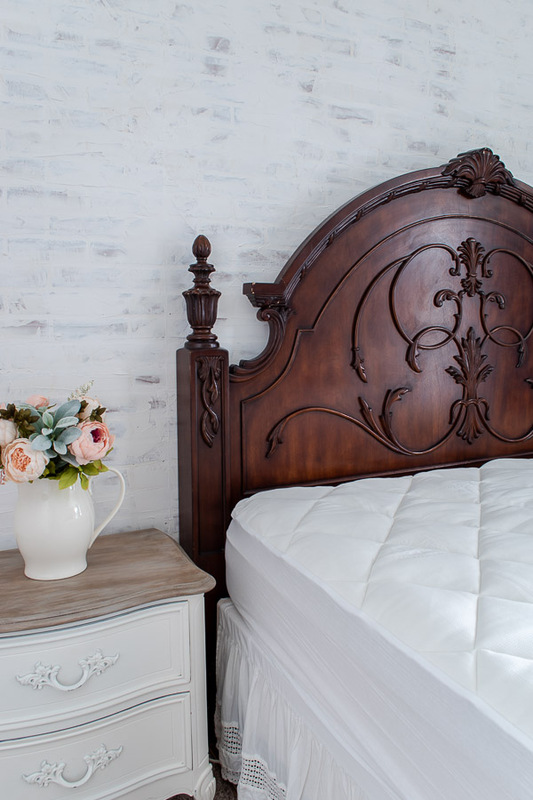 Welcome to Week 2 of the ORC, when our Master bedroom European Farmhouse makeover takes off! 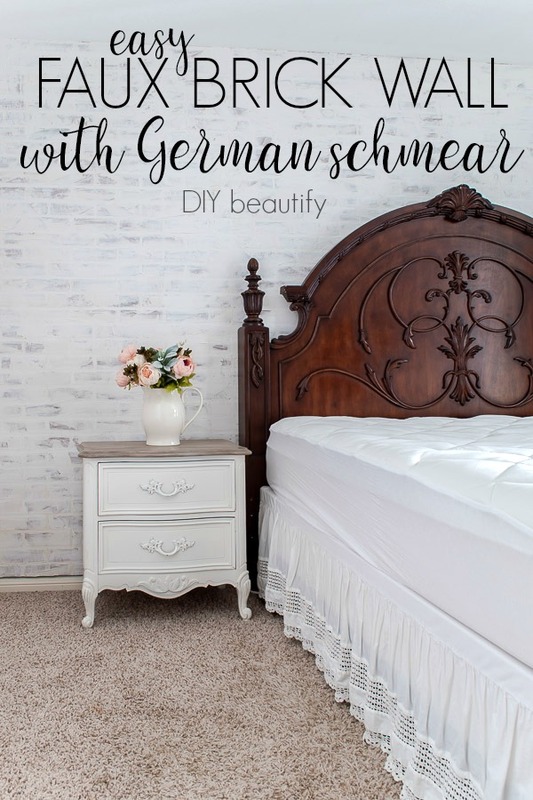 Today I'm sharing how we added a faux brick wall and did a German Schmear treatment on top! You can catch up on other week's projects by clicking on the links below. At this point, we're on Week 2 so the only catch-up would be our Master bedroom plan. I'll be completely honest that I thought this project was going to be difficult! 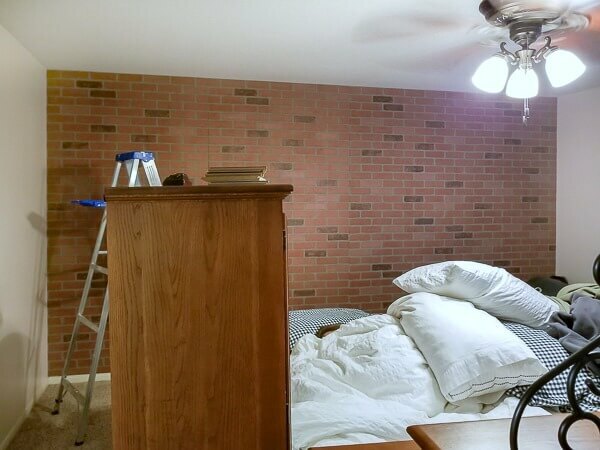 I researched ways to add a faux brick wall for months leading up to our Master bedroom makeover! As always, Instagram was filled with ideas...like Natalie's approach, using her finger to create grout lines. But then I saw Hayden's super budget friendly brick wall which used painter's tape. Until I thought about the actually process of trying to make straight lines with tape...and a bad back 😟 I didn't give up though, kept looking for inspiration and when I spotted Whitney's gorgeous faux brick wall in her guest room, I knew this was the technique that would be perfect for our project! There's not much to love about the current state of our room! And those green walls were the first thing to go! Once Mr DIY and our son moved all our furniture into the middle of the room, I was cleared to paint. One of my favorite white paints is Bistro White by Valspar. It's the perfect white in my opinion...not too stark, not too creamy. I find it reads as a true white in our home and pairs well with our gray walls and farmhouse neutrals. It is considered a 'warm white' if that helps you. We used it in our sunroom makeover as well as in my farmhouse office, which is right off those french doors in our master. When you are painting white over a darker color (like beige and green in our case), you will need to do two coats...UGH...I know, it's a bummer! But there's no way around it! 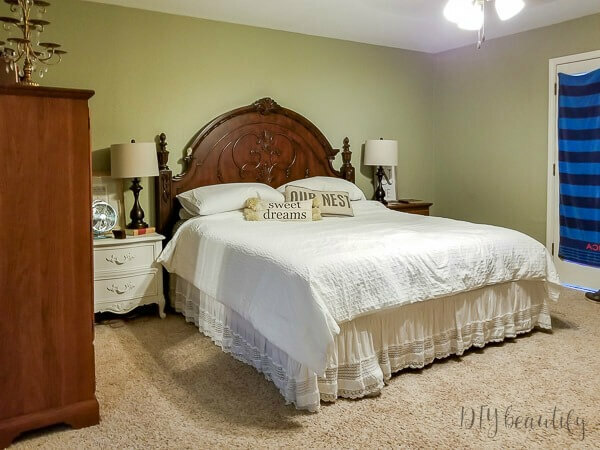 I worked my way around our master bedroom walls (leaving the focal wall green for now), and then did it all again. I was wiped out by the end of the day, but the room was WHITE!!! And of course I forgot to take a pic! 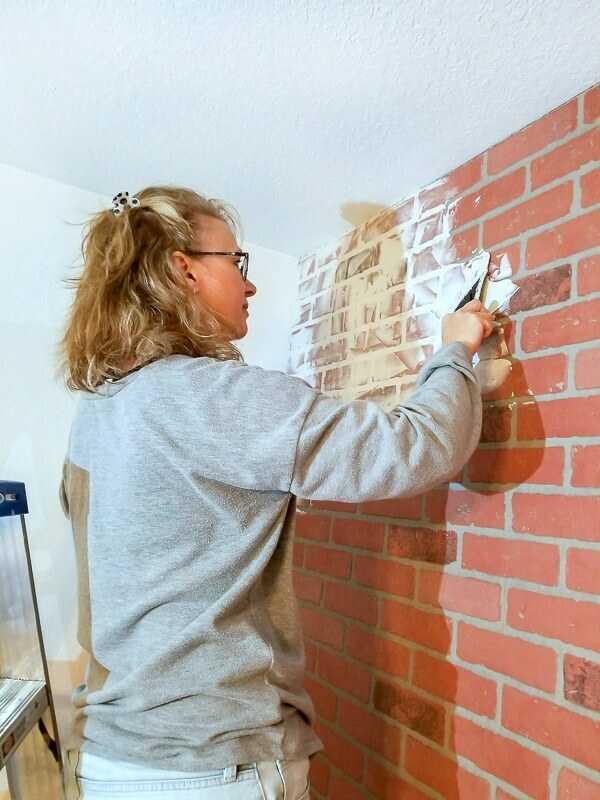 But that's ok because the real focus of this week is that faux brick wall with German schmear, and I was pleasantly surprised at how easy it was! 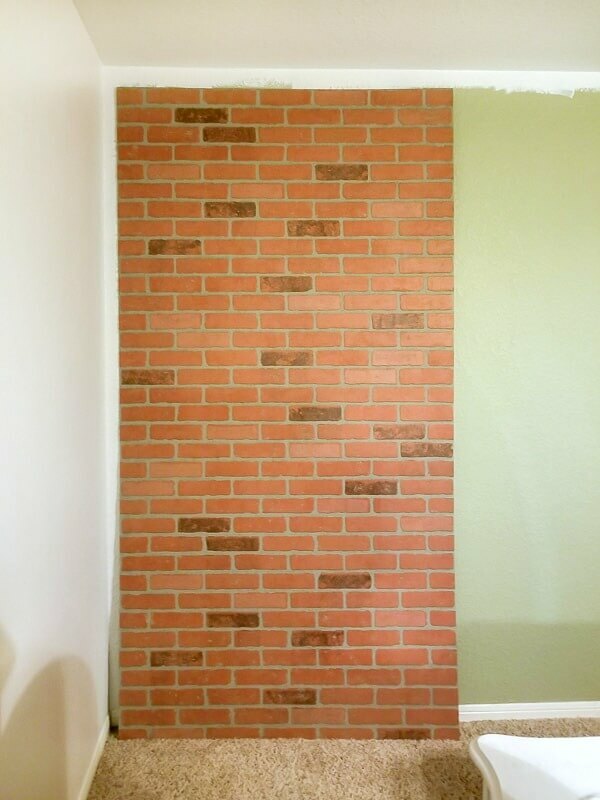 FYI...this is not the least expensive of the faux brick tutorials out there! This one cost us about $130 for the entire wall (our bedroom is huge! ), which is still pretty cheap in my opinion! If you're looking for an even less expensive option, click on one of those links I shared up above. The first step is to carefully measure your wall and cut your brick panels to size. We needed to purchase 4 panels and had to cut a little off the ends, as well as the side of the last one. The compound miter saw we purchased last year when we added the wood walls in our sunroom was put to use again! It made trimming these boards down very easy! If you don't own this type of saw, you can rent one for half a day! Here's a close up of the brick panel outside where the lighting is better. You can see that it's not very thick, but it has a nice authentic looking texture to it! 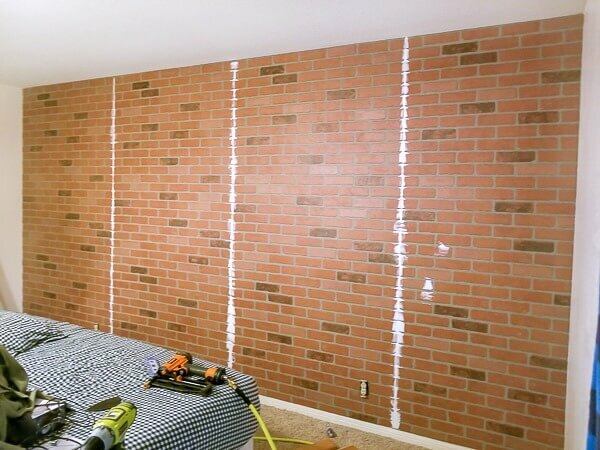 Once we marked the studs, we nailed the brick panels into our wall, being very generous with the nails. There were a few panels that ended where there was no stud, but we were able to nail each individual brick to better hold the panel to the wall. And it appears I didn't take a picture of this step, probably because both my hands were needed to hold the brick in place while Mr DIY did the nailing. Repeat for all the panels. Again they're not actually nailed yet, but this gives you an idea. We were careful to match up grout lines when we added another panel. I did remember to take a picture once all the panels were up and nailed. And of course, at this point Mr DIY thought it looked great and we should just leave it. But nope, I had my vision! Once all four panels were securely attached, we caulked the seams. In hindsight, I'm not sure this step is necessary, but I wanted to try to disguise the seams as much as possible before doing the German schmear treatment. Mr DIY purchased the pre-mixed joint compound just because it was easier. If you want, you can save a couple bucks and mix your own. Insider Tip: after following other tutorials, the recommendation was to use a wide plastic putty knife rather than a metal one. The plastic one is more flexible, allowing you to get the joint compound where you want it. ...and in this picture I'm getting close to finishing the top portion. I found it easiest to work my way across the top half and then come back and do the bottom half. We left the joint compound to dry overnight. In the morning, I could see that the grout lines had dried kind of yellowish. I was half expecting this to happen, as others had this issue so I was prepared. I mixed up a whitewash using 1:1 wall paint and warm water and then simply brushed it on the entire wall. You can see in the image below that the left hand side of the picture has been whitewashed. It really helped to not only cover the yellow, but to blend the whole wall together, giving it that old world charm that I was after! I am in love with how it turned out! It has great texture because I was careful not to smooth the joint compound too much! 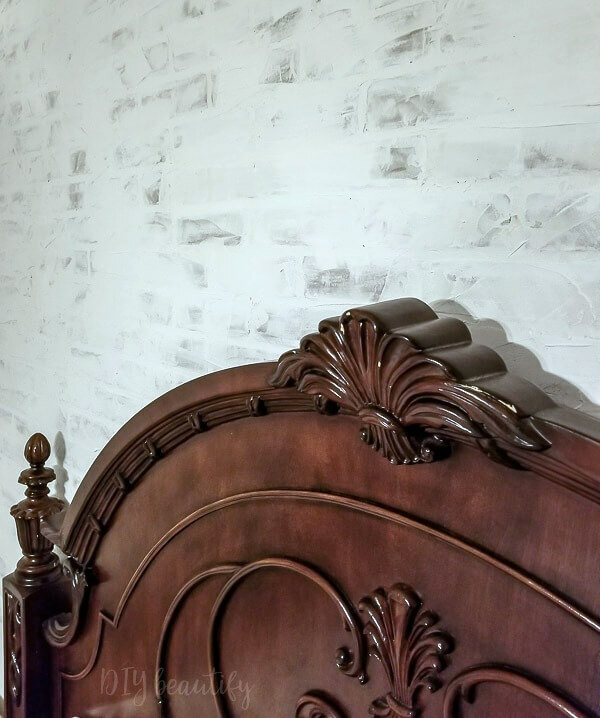 I really love how our dark headboard looks against the faux brick wall...so much so that I wonder what I could have been thinking to consider painting it! I've decided NOT to paint the headboard! 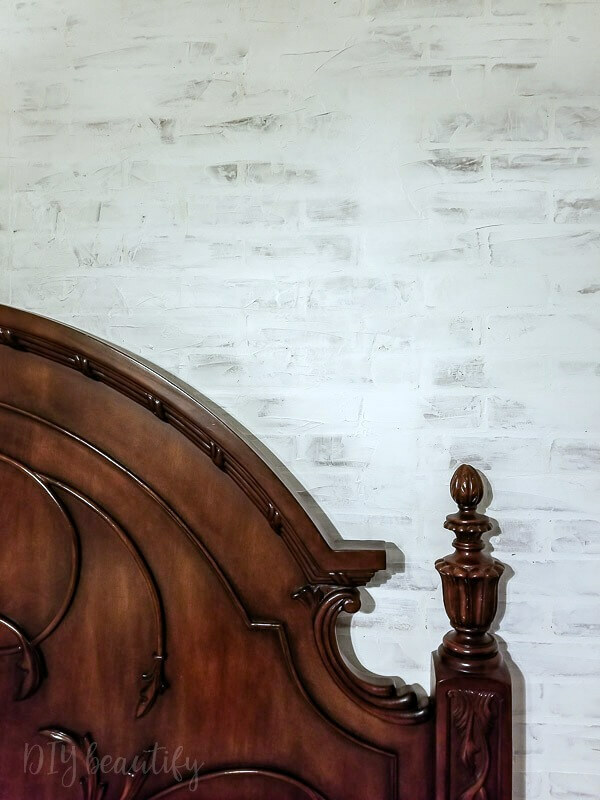 The contrast of the dark headboard with the white distressed brick is just perfect! 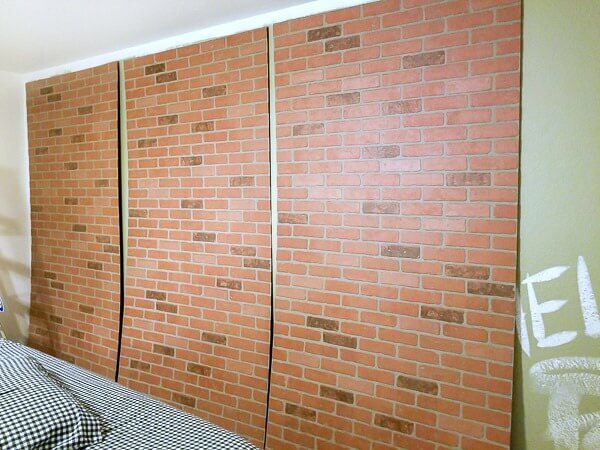 I can't stop staring at my new faux brick wall! 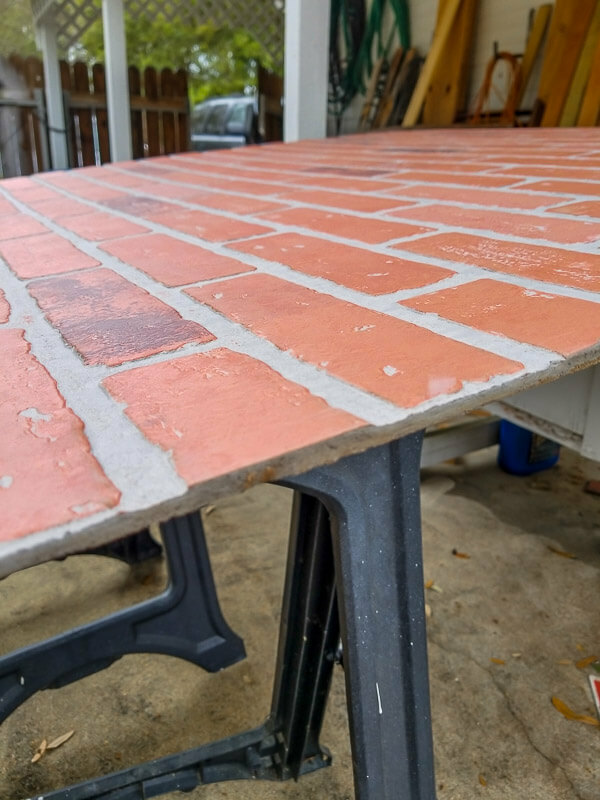 If you have any questions about this project, either the faux brick panels or the German schmear, please feel free to ask in the comments section below! Next week I'm going to tackle the dressers. I have an idea that doesn't involve chalk paint (for once!). Wish me luck. 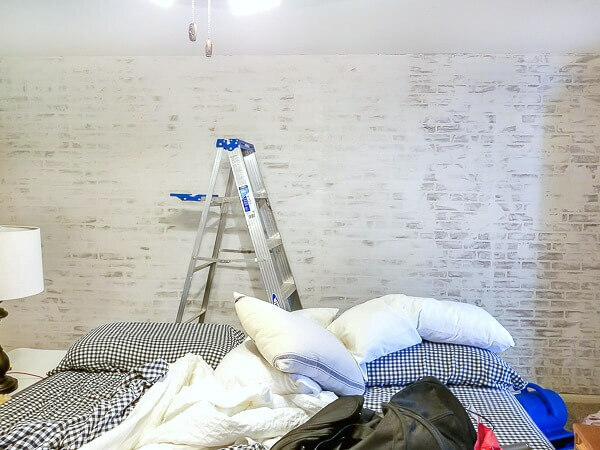 I can't wait to share more of our Master bedroom makeover progress with you! 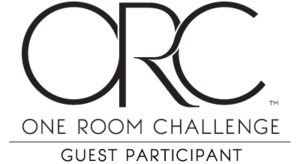 Remember, if you want to follow along with all the ORC participants and see all the rooms that are being made over, you can click here.